Leighanne LaMarre Interiors, LLC is a full service interior design firm based in Brighton, MI, but we are currently working on projects across the country. We specialize in all aspects of the residential design and building process. Our team of educated and experienced designers work together and, through a series of of integrated and tailored services, provide clients with a seamless design experience from start to finish. Michigan's Full Service Interior Design Professional. Best of Houzz! Sharon Kory Interiors is a full service interior design studio specializing in commercial and residential custom design. With over twenty years of experience in the industry, our focus is on creating creating environments that support individual style. Sharon approaches each assignment as a creative collaboration between client and professional. It is our goal to create a space that will harmoniously combine aesthetics, function, comfort and budget. Our experience ranges in scope and style affording SKI exceptional preference in working with architects and contractors. We believe that creating the optimum environment, whether personal or professional is an honor to be taken seriously as well as to be enjoyed in the process. SKI continues to deliver warm, elegant, timeless interiors across the country and throughout southeast Michigan. To inquire about SKI’s services, please email sharonkory@gmail.com. FRESH + MODERN and SOPHISTICATED, we specialize in many different styles of design: Farmhouse, Mid-Century Modern, Scandinavian, Boho-Modern, Traditional and Transitional. With over 15 years experience, we are Detroit Metro based designers that have designed everything from beach houses in Florida to cool lofts in Chicago!! Let us help you get the new look and feel of the house of your dreams! Lark Interior Design specializes in creating timeless spaces that reflect the client's taste and lifestyle. Best of Houzz 2013, 2014, 2015, 2016, 2017 and 2018award winner for Design and Customer Satisfaction. Lark Interior Design is a Detroit, Michigan based full-service interior design firm. It is committed to creating beautiful environments that seamlessly balance function and style. Mandy Lark is the creative force behind the Company. Mandy's passion for her work is apparent in every space she designs. Utilizing her experience, expertise and honed taste, each space reflects the lives and tastes of her clients. With a fresh and energetic approach to each project, Mandy skillfully and tastefully transforms the ordinary into a classic and functional space. Mandy designs with a mix of contemporary and traditional finishes and utilizes the classic design principles of scale, proportion and balance to create a unique environment. The design process is a collaboration of the client's taste, needs and budget. She believes that a fluid designer-client relationship is imperative to create a successful project. Houzz Contributer. Sarah Macklem is a Home Stylist providing affordable design services for real people around the globe. Sarah also writes the popular Home Design Blog: <a rel="nofollow" target="_blank" href="http://www.TheYellowCapeCod.com">http://www.TheYellowCapeCod.com</a>. "Best of Houzz" for six straight years At Valia Design, we believe that more than anything else, your home should be a reflection of you - your personality, your style and your lifestyle needs. With over 15 years of certified experience, Valia serves both residential and commercial clients and provides custom Interior Design and Project Management services. Whether working on a full scale renovation or revamping a single room, Valia Design promises to exceed expectations from start to finish and will transform your space in a manner that maintains budget, large or small. A good home design professional will hone your style down to its very essence and be able to choose a functional layout that feels natural to you. Interior design companies can be involved as much or as little as the client desires. Many clients who hire an interior decorator in Garden City, MI — particularly those who are remodeling — have a good sense of how the room should look and what products they should use. Often clients will insist that interior decorators use the products already present in the house. Other times a designer will need to start from scratch — especially if this is a newly purchased or just-built home. An interior design company will need to figure out exactly what the client needs, which includes organizing rooms, picking flooring and wall colors, and finding furniture to complement it all. Sometimes that means he or she will have to recruit help from other Garden City, MI home professionals to help create the perfect look for your renovation. Here are some related professionals and vendors to complement the work of interior designers & decorators: Architects & Building Designers, General Contractors, Home Builders, Design-Build Firms, Photographers. Do your research before meeting with an interior designer or home decorator in Garden City, MI. Ask yourself what you want your space to become and what it will be used for. Figure out the extent of what you need help with, what your must-haves are and what your budget is. Interior design services can add up fast, so be up front with a potential design firm or individual from the beginning. Also, pick an interior decorator that fits your style. Browse through the portfolios of different Garden City interior design firms and decide if you would live in those houses. Just because you like something doesn’t mean you could live in it. There's a big difference! Find an interior designer or home decorator in Garden City, MI on Houzz. Narrow your search in the Professionals section to find Garden City interior designers near you. 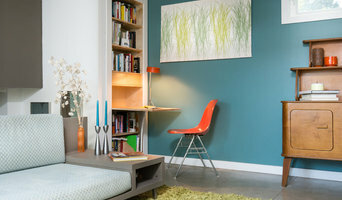 You can also look through Garden City, MI photos to find a room you like, then contact the design firm who designed it.